When a fully-grown dragon decides to take up residence in a mountain nearby Ponyville, his snoring threatens to cover all of Equestria in smoke for a century. Twilight and friends are tasked with convincing him to leave, but Fluttershy’s phobia of dragons has her less than enthusiastic to lend her assistance. Will the others be able to succeed without her? It’s tricky to know exactly where to begin with this episode, because quite frankly, I think this is the show at its absolute best. It’s remained a favorite of mine for four seasons running and never lost its position as one of the best episodes the series has ever put out. 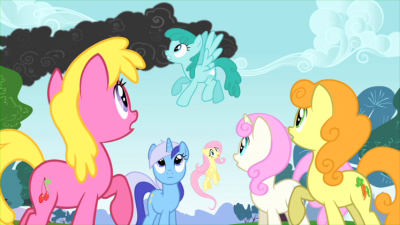 For one, while this is definitely a Fluttershy-centric episode, every character plays a role in it, and it’s an example of an episode in which all six characters aren’t just present for the sake of being there, but actively working together to help solve a larger issue. It’s also an adventure story that vaguely invokes The Hobbit (Tolkien and his stories have been a stated inspiration for a few things in the series, and while this doesn’t follow the beats of that book, it definitely invokes some of the flavor of it), and one that actually manages to feel engaging and complete without the running time presenting a problem (which some of the larger adventure plots will unfortunately run into). I actually consistently forget that this episode runs through its story beats fairly quickly, and yet nothing feels rushed. That’s not to say that every character is at their best, but they’re still all very much in line with who they are as characters. I remembered Rainbow Dash being less than faithful in Fluttershy’s ability to do, well, anything, but I forgot to what extent she’s just downright mean about it. It’s born out of her own frustration, since Fluttershy both winds up setting the pace for the team (which is much slower than she’d like) as well as representing the polar opposite of how Rainbow wants to deal with the problem. Twilight’s plan involves Fluttershy being able to convince the dragon to leave peacefully, while Rainbow Dash wants to cut past all the red tape and just eject the beast forcefully (which she genuinely seems to believe is the right way to go with it right up until she tries to do it and realizes exactly why it’s a bad idea). Rarity is genuinely interested in helping, but winds up more than slightly distracted by the idea of getting her hooves on some of the dragon’s treasure in the process. Her approach of trying to sweet-talk the dragon out of the cave actually makes some progress, and she might have actually succeeded except that she lets her desire to snag some of his belongings show a little too much, and he sees through her ruse. Applejack winds up playing the heart of the team, doing her best to motivate Fluttershy to work past her fears and keep the group on pace with each other (even as Rainbow Dash jeers at the idea every step of the way). We’ve talked about how AJ and Dash might possibly have done better with each other’s element, and this episode is probably where that argument is at its strongest, with Applejack putting in extra work to carry a friend up a longer section of the mountain that she might be more comfortable with, and Rainbow Dash’s nastily blunt (even if true) observations about why they’re moving so slowly. Twilight gets to show off her leadership skills, both in making the initial announcement about what’s going on (which poor Fluttershy tries to do beforehand without being able to get anypony’s attention), as well as putting together the plan for taking care of the problem. She has a firm idea of what each of her friends can do to help, but unfortunately for her things go awry due to several of them having slightly different ideas of how to handle it (or in Rarity’s case, what the goal is). In addition, she’s so focused on her own plan that she completely miscalculates Fluttershy’s willingness to go along with it. Unfortunately Flutters is also the key part of her plan, and in Twilight’s mind all she has to do is get her up the mountain and then the rest will just happen. Twilight being oblivious to what’s actually going on around her because she’s so focused on what she thinks should happen is very much in character for her, and here she almost outright ignores Fluttershy out of her need to stick to the plan. 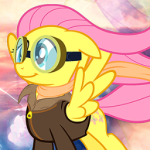 This episode is, by and large, about standing up against your fears when the need arises, and it’s embodied entirely in Fluttershy. She’s generally timid (which Twilight accounted for in her plan), but on top of her natural inclination to shy away from the action, she’s being asked to come face to face with what’s arguably her largest phobia, the dread of which magnifies everything else coming before it for her. In the end, it’s her friends being put in danger that causes her to spring to action. It’s a side of her we haven’t seen much of yet, but it’s very much a part of who she is. She’ll avoid conflict like the plague and is doesn’t put up much of a fight against others walking all over her, but if her friends are at risk, the perpetrator will likely have a very angry little yellow pegasus staring them down in the face and hitting them with the mother of all guilt trips. While it isn’t called out by name, this is also possibly the first example of “The Stare” at work, although all of the uses of it after this will look different and be much more deliberate, so this possibly doesn’t count. I saved Pinkie for last mostly because the most interesting thing involving her in this episode isn’t even in the episode. She largely just sees the whole thing as a fun outing, and is genuinely enjoying each and every bump along the way. Her major contribution is in being the one to actually motivate Fluttershy into trying to jump over the chasm. A Hop, Skip and Jump was originally going to be a full song, and was actually recorded by Shannon Chan-Kent for the episode, but instead it got turned into the short snippet that’s in the episode. This also marks the first time in the series that Andrea Libman sings Pinkie’s part in a song, short as it is. The change was likely done for time, and probably for the best, since bringing things to a halt to have a full number (even though it’s relatively short even at full length) would likely have messed with the pacing pretty badly. Angel’s back in this episode, and he’s just as much of an unruly spoiled brat of a kid as always. Even Fluttershy can’t get him to behave at times, and this isn’t even him at his worst behavior. Poor Spike gets stuck trying to take care of him while the others are gone, and the two not particularly liking each other or getting along is pretty much set in stone (which may have been an intentional choice given their names). One last thing I wanted to touch on. 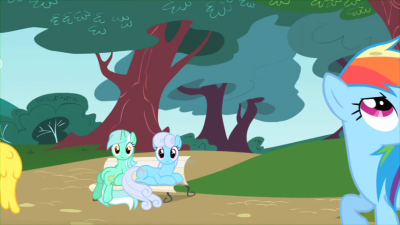 The beginning of this episode is the culprit behind the most prevalent fan characterization of the background pony known as Lyra Heartstrings. 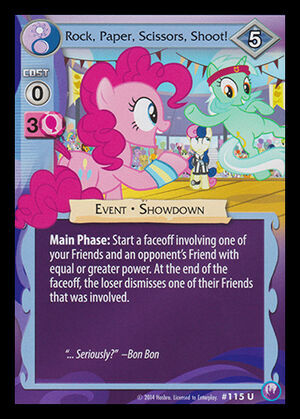 This single shot of her sitting “like a human” (or at least, unlike a pony) in the bench spiraled wildly into fanon flanderization so strongly that even the official TCG runs with it. She very quickly was characterized as everything from being obsessed with humans (usually in the vein of being the only one who believes they exist) to being a human-turned-pony who somehow came to Equestria (which gained huge amounts of steam when Equestria Girls debuted and Lyra was noticeably absent from it). 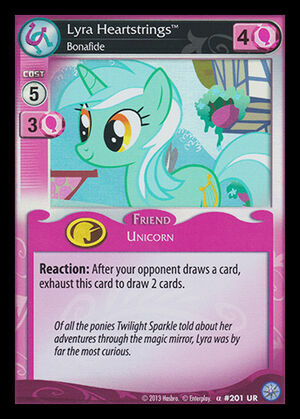 It’s worth noting (somewhat amusingly) that this is really the only example of Lyra doing something like this out of the ordinary, making the characterization almost entirely fan-created. Dragonshy. This is my favorite episode of Season 1, and like Tessa I think it’s one of the very best in the entire series. It’s also very often my first pick for introducing newcomers to the fandom, as it’s right in the sweet spot between “not so early that you have to start from square one” and “not so deep into the series that you won’t understand anything,” and it’s loads of fun to boot. This is the first real “adventure” we get since the series opener, and while normally I don’t like adventure episodes quite as much as slice-of-life-isodes, this one stands out as a thoroughly enjoyable adventure episode for me. Many of the other adventures in MLP:FiM try to cram too much into too little time, even when they have two entire episodes to do (as is the case with several of the season openers/finales), which invariably leads to rushed endings and somewhat dashed hopes. Dragonshy, on the other hoof, is very well-paced and is able to spend a good deal of time focusing on the characters while still progressing the story. It even somehow has time left over to insert a great deal of silly gags, hilarious quips, and adorable moments. And yes, that it is a Fluttershy episode certainly helps quite a bit as well. Speaking of trolls, I don’t know how Fluttershy can put up with Angel Bunny the way she does. I have so many mixed feelings about that little white ball of fluff and sass. One second he and Fluttershy are the best of friends, the next second he’s chucking carrots at her head, and the next he’s helping to keep Fluttershy safe from danger. We haven’t yet seen all the ways that their dynamic manifests, but boy howdy it’s headache-inducing… yet at the same time it’s kind of endearing in the way that the odd relationship between Ned Flanders and Homer Simpson is endearing. Which is endearing, to be sure, but in a way I can’t quite put my finger on. So anyway, it’s quest time! The little montage scene of all the ponies gearing up for this important mission is just one of the many fun bits this episode manages to work in, and I’ve got to say it’s executed brilliantly. In the span of 40 seconds we get five scenes that manage to vividly portray the characteristics of five of the Mane Six (where was Twilight’s scene, anyway?! ), something that entire episodes occasionally fail to do in 22 minutes. I have to say, though, that the only thing that was going through my mind while re-watching this was the D.E.S.U. montage scene from the hilarious (if somewhat off-color) parody series Friendship is Witchcraft. At least Twilight was in that one! As much as I absolutely love Fluttershy, I understand that there are many out there who have a hard time warming up to her, much like I had a rather difficult time warming up to Pinkie Pie and Rarity (my frustrations with Rarity have not yet surfaced; I think it takes a few more episodes for that). For these folks, I’m sure this episode only further cemented their position on poor shyhorse, much like Rainbow Dash just gets more and more fed up with her apparent inability to do anything helpful at all. The disdain in Dash’s eyes here is scalding but nonetheless understandable: Fluttershy is a pegasus and as such she should be having absolutely no trouble getting up the mountain, yet she is causing the most trouble for the group with her inability/unwillingness to fly (for the record, the scene where Fluttershy’s wings seem glued shut is so tragically adorable). Pegasi are supposed to be the fearless fighters, the aerial archons, the headstrong heroes; Fluttershy is none of these, and it drives Dash, arguably the epitome of said characteristics, crazy. Not to try and psychoanalyze here, but it’s pretty clear that Fluttershy has some pretty deep-rooted anxiety issues, and Rainbow Dash either doesn’t understand this or is actively rejecting it. While this is somewhat of a shaky analogy, I see Fluttershy as Boggle and Rainbow Dash as the fox in this touching Tumblr picture about anxiety. I think Fluttershy wants to be brave and to help her friends, but she is plagued with barriers she simply doesn’t know how to overcome on her own. It’s heartwarming to see Applejack (perhaps the mouse in the aforementioned picture) doing everything she can to try and help Fluttershy out. +1 to loyalty for AJ once again. Come on, Dashie, keep up! Fortunately, there are so many gags and jokes and funny faces going on during the ascent up the mountain that the uncomfortableness of trying to deal with Fluttershy’s anxiety doesn’t outright consume the entire episode, which would have probably made it far to inaccessible for the target audience. 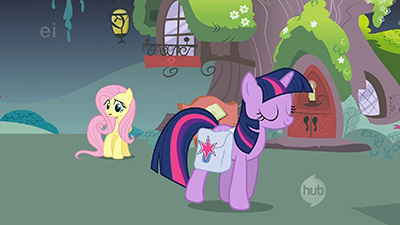 I had forgotten how surprisingly plentiful these funny bits were in this episode and really applaud the writers for being able to intersperse them so well within the “quest” storyline and the exploration of Fluttershy’s character. Remember that line I’ve talked about in previous deconstructions? This episode shows us what can happen when Fluttershy’s line is crossed. Most of the time she will cower or cry in the face of adversity (even if said adversity is as benign as her own shadow), but every now and then Fluttershy will respond with force enough to take down a dragon. I don’t think she even knows when it’s going to happen this way or exactly how her reaction will manifest. We will revisit this phenomenon throughout the series, but not in the “going back to the well” sense: rather, we examine it from different angles and discover that it’s quite a complex and multifaceted aspect of Fluttershy’s character. We see it taken to different extremes, and even see it brought under control in a scene much much later on in the series that is very minor and understated yet nonetheless exemplifies that these are dynamic characters who grow and mature throughout the series. That said, I do appreciate that our first foray into Fluttershy’s “over the line” territory is neither stereotypical (complete emotional breakdown on one end, unstoppable rage machine on the other) nor particularly predictable (at least not for me the first time I watched the episode, anyway). We see a pony who clearly struggles with inner demons, but one who does not let them completely consume her when it’s time for her to shine. So anyway, fantastic episode in my books. As much as I love this show, there are some episodes that simply do not leave me with the warm and fuzzies after I watch them; Dragonshy is not one of those, as it leaves me with the warm and fuzzies each and every time, even after all these years. Also, Flutterdragon is the most adorable dragon. I agree with a lot of what’s said above. Well-paced adventure story, with some nice light Tolkien callbacks without getting bogged down in anything specific. I love how it makes use of the full cast, playing their distinctions and dynamics well. I love the idea of Twilight getting so caught up in a plan that, when the one element she’s hinged it all on fails to work out, everyone else has to take turns throwing what they have at the situation only to wind up short. I even love the twist at the end, of Fluttershy finally flaring into action and giving that dragon what for, but not in an antagonistic way, rather reminding him that he knows full well he’s being a posterior region and not letting up until he takes responsibility for it. That’s all great stuff, and there’s a lot of zany moments and great animation throughout. I get what you mean, Gerf, about how this is an episode that will grate on those who aren’t fans of Fluttershy. The thing is, I do like her character, and it still grates on me, much in the same way “Applebuck Season” did, even though I also quite like Applejack as a character. What I mean by this is that both episodes take the character’s central… weakness might not be the right word, but the personality issue which often gets in their way – stubbornness for Applejack, timidness for Fluttershy – and hinges their story so heavily on that aspect, exaggerating it so far into an extreme that it starts to feel artificial. Fluttershy’s phobia of dragons is there entirely because the writer wants it to be, building off of nothing we’ve seen or learned about her before, and even an attempt to brush past that by referencing her lack of issue with Spike feels hollow. We’ve seen Fluttershy on an adventure in the past, and she held her own, didn’t drag back the group, didn’t drop to her back in paralysis at the touch of a leaf, and never once flinched away from facing down the fearsome manticore. I don’t see why the Dragon is such a different issue and why it impairs her to such a degree that the others are physically dragging her around. I absolutely get Rainbow Dash’s treatment of her, not only from the character dynamic, but because the writers have cranked Fluttershy up to such a degree that the plotting necessities are visibility overwhelming faithfulness to how the character has been portrayed to this point. I don’t blame Fluttershy for any of this, I just feel bad the writers felt they needed to push it so far. Having something that scares her so much that she shuts down and is unable to proceed, okay, but this is overly drawn out and played too far to sell the lesson. As for the others, I love Applejack’s loyalty and patience with Fluttershy, but it’s a shame she doesn’t get a moment with the dragon when everyone else does. She shows off her apple-kicking, but never actually gets to put it to use. Pinkie is Pinkie, living life as a gag, and some of it (invitation) works better than others (song), but at least she’s consistent, and I like that we never even see her encounter with the dragon, just how well it didn’t go. I mentioned Twilight above. Rainbow, I do really like all of her bluster ultimately coming to naught as her swift kick doesn’t deliver the results she hoped for. Rarity is a bit odd. I love some moments (the camo hat), but I’m not sure how I feel about her primary motive being a desire to swipe jewelry. She initially says she wants to ask the dragon for some, which is one thing, but then she straight out tries to con the entire hoard from him afterwards. It shows a level of greed and vanity that feels tonally off from the grace with which she usually carries her fashion passion. So it is an episode that does have issues for me, and as Fluttershy’s inability to function is such a large amount of the episode, that does overwhelm it a little. But it is still a good one. It doesn’t offend me in the way “Applebuck Season” did, and has a much more satisfying payoff to ultimately make it worth-while. And it does move at a great clip, looks great (a little iffy on the smoke, but it’s consistent with how they portrayed that rolling river), and does a nice job of showing the entire group playing off one another. So I’ll go with it in the end. 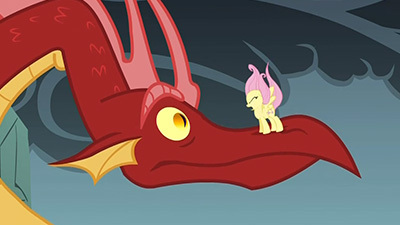 I do also want to point out that while yes, Fluttershy’s dragon phobia is a bit of an after-the-fact decision (since it does clash pretty badly with her excitement over meeting Spike back when she was introduced and Noel is right that the attempt to explain that comes off a bit forced), it’s something that now that they’ve made it a part of her character sticks with her. Fully-grown dragons will show up again in other episodes, and Fluttershy’s phobia will still be a thing (provided she’s actually around for it to be relevant, of course). Oh, and speaking of the Lyra being obsessed with humans thing: there’s a wonderfully fun fanfic of this called Anthropology that I’d wholeheartedly recommend. It’s rather long and just one of a zillion Lyra-loves-humans fics I’m sure are out there, but it’s an enjoyable read. It even has its own fan-made theme song and animatic!